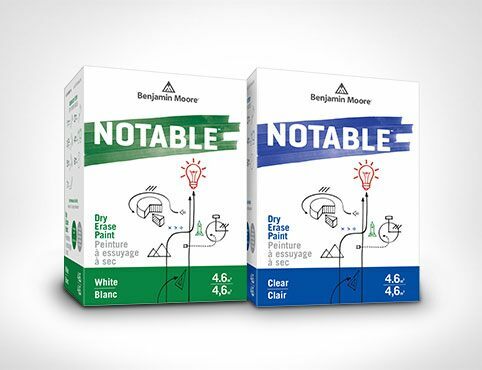 Apply premium performance Notable® Dry Erase Paint to almost any surface. Opt for classic “whiteboard” Notable White or Notable Clear, which transforms any paint colour on the wall into a dry erase board. Notable dry erase paint enhances painting projects, converting walls of all sizes into areas that are both creative and practical. Some ideas are bigger than a whiteboard: See Notable in action. Whether in a residential, professional or commercial interior space, Notable supports the concept that great ideas can surface anywhere. Accessible dry erase boards are made easy with our comprehensive kit, which comes with a 2-component paint system, a roller-cover, and detailed application instructions. Notable helps convert every space into creative space. 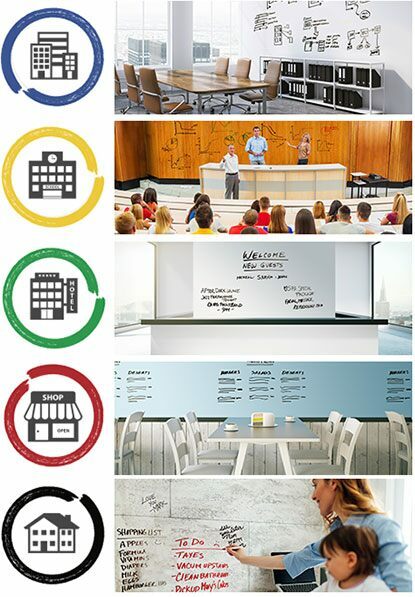 Office buildings–Turn every wall into a springboard for opportunity. Schools and universities–Creative interactions flourish when dry erase boards are accessible to learners. Hotels–Give busy guests and staff quick need-to-know info. Restaurants–Easily update food and drink specials in both kitchen and dining spaces. Homes–Merge fun with functional in home offices, kitchens, furnished basements, kids rooms and more. Notable is for professional use in interior commercial or residential spaces. Afterall, walls are everywhere: Notable helps bring them to life. Opt for the classic whiteboard look in Notable White. 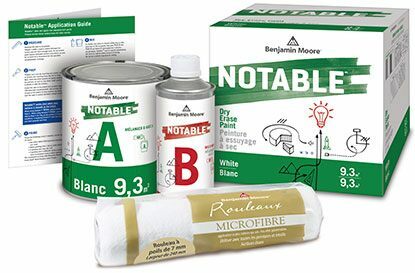 Or try Notable Clear and transform any new or existing Benjamin Moore colour into a dry erase surface. With Notable on your walls, you can grab your dry erase markers–we recommend Expo Bold for the best results –and let big ideas spring up anywhere. Easy to erase–Making it easy for fresh ideas to keep coming. No yellowing, cracking or peeling–Notable’s high gloss keeps walls looking ever-fresh. 10-year limited warranty–You won’t need it, but it’s nice to know it’s there. Isocyanate-free–Makes application more user friendly. 4-hour pot life–Other whiteboard paints allow only 1 hour to paint after mixing. We give you more time to get the job done. Watch as our experts prep and apply Notable Dry Erase Paint in this helpful video. 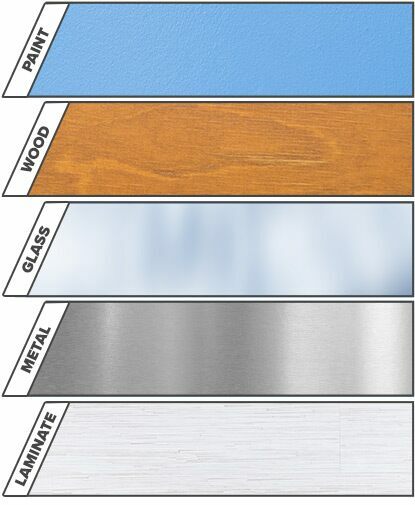 Prepping is key–measure your space and be exact when choosing from 4.6, 9.3 or 18.6 sq. m. kits (50, 100 or 200 sq. ft): Avoid “stretching” Notable dry erase paint so that writing or erasing is never compromised. Download the Application Guide in English/French. Premium performance dry erase paint that can be applied to almost any surface, in white or clear.